How’s the tour going so far? I think you’re about a week into it. Great, it’s been really good. It’s been a while since we’ve done a proper headlining tour in the States. So I know with this record you were influenced because you wanted to play more up-tempo, aggressive songs live. Are you happy with how they’ve been going over live so far? Absolutely, yeah. They’re a blast to play live, all the new songs. We’re super happy with the record and feel like it translates really well live. I was looking at your setlist for this tour and was interested to see you’re playing “I’d Like to Die,” because you don’t usually play that many b-sides live. How did that song make the cut? We did an acoustic tour. Well, basically it was like an Anberlin light tour, last year. We randomly started playing that song on that tour. Not a lot of fans knew it but as a band we loved playing it, so we decided to play it on this tour. I love playing it. I feel like not a lot of fans even know what that song is. It’s a deep cut. I’m not even sure what it’s on. I think it was an exclusive song on Dark Is the Way. It’s just a cool song and the way we do it live is cool. We put keys on it with this synth pad thing. It’s different. We try to incorporate different aspects of Anberlin into our set and our show, try to show everything that we can do. That was what was fun about the acoustic tour. I don’t think a lot of bands can pull that off, rearranging all your songs with keyboards and just really mellow versions of the songs. Even on this tour Stephen’s been playing “Dismantle. Repair.” with just him and a piano. It’s an arrangement he did and I think that’s what we try to do with our live set, give you different views of what Anberlin is or can be. Do you think you’ll do another acoustic run this year, maybe hit some of the places you weren’t able to last year? Maybe. We’ve definitely talked about it. I don’t know about this year, but maybe towards the end of the cycle. We only played for a few weeks on that tour, because we didn’t know how it was going to go, but it was awesome. It really was fun to play. It was a completely different show. It was different for me, definitely. I got to stand there and play my part, not rocking out. It was really cool. I think the fans really appreciated it. It was something unique, so we’ve talked about doing it again, for sure. I remember reading a couple comments online that said they thought it was their favorite time ever seeing you. Yeah, we hear that a lot. We’ve talked to a lot of fans who have seen us live and that was their favorite show. I think it was just different. It was lot more intimate and laid back. I think live we try to be very professional, running songs together and having a really cohesive setlist. The acoustic set felt a little more off the cuff, with talking in between the songs and stuff like that. 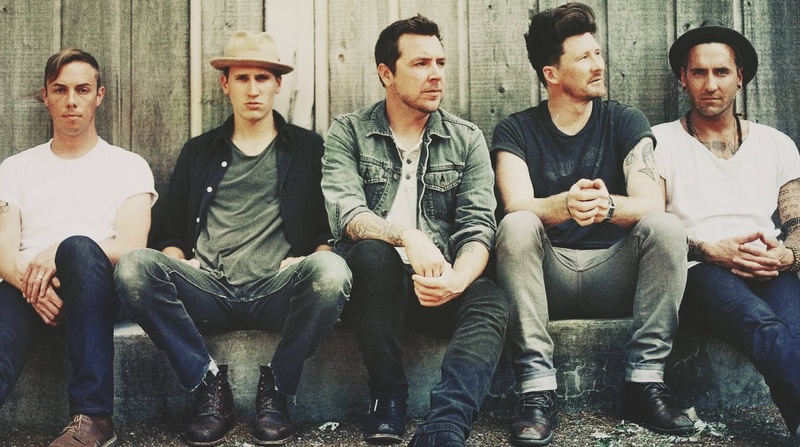 So Vital seemed to get a really good response from the Anberlin core base, with a lot of people ranking it up there with Cities as some of the band’s best work, but it seems on the outside it hasn’t found a wider audience as the last couple records did. Is that something you’ve picked up on as well? We’ve got some things up our sleeves, so hopefully they’ll be some changes coming up and some more promotion. It’s definitely been frustrating because we feel like we just released one of our best records. Unless you follow us on Facebook or Twitter, you might not know. You know what I mean? I’m like that with a lot of bands. Sometimes if I don’t actively seek out if they’ve released a record, I wouldn’t know. I didn’t know the new Converge was coming out until I randomly looked at their Facebook to see if they were touring. I was like, Oh crap! They just released a new record. That’s awesome. We feel like that’s kind of the case with us. There wasn’t really a radio campaign for this record, and that’s really the only way labels can market. I talked to Stephen last summer for the Anchor & Braille record and he was saying “Self-Starter” was the lead single. That was the first song that was released, but then I guess “Someone Anyone” ending up being the official single, which didn’t go anywhere and that video still hasn’t come out. Can you talk about what happened with that whole situation? We were pretty set on “Self-Starter” as a band. We felt like it was a really unique song and really represented the record. Our radio guy loved “Someone Anyone.” Basically, he was really dialing in on that song and sold us on it. You always want the people you’re working with to be excited. He was really excited about that song, so he changed our opinion. He was basically like, “We’re going to release ‘Someone Anyone’ as the radio single but we’ll release ‘Self-Starter’ first as people’s first taste of the record,” which seemed like a fair trade. So we released “Someone Anyone,” and the radio campaign ended up falling apart. We did shoot a video for it. It’s done [laughs], but it might not be for “Someone Anyone” anymore because we’re not even in the video. This guy, Jodeb, he’s done a bunch of really cool videos. He did the Deftones “You’ve Seen the Butcher” video. He did an Underoath video. He’s done a Porter Robinson video. His videos look insane. They look like you spent millions of dollars, but they’re relatively not that expensive. So that video is done, but it might be to different music. We have a lot of stuff coming up here in the rest of this year. That’s going to come out at some point. It’s not like it got shelved or whatever. I mean, we paid for it. It’s been a weird release so far for us, but we’re still moving forward. Is this the last record on your Universal contract or do you still have more stuff with them? It was always a record-to-record contract. They always got the option to resign us after every record. It was always a one record deal, but they kept resigning us after every record. I can probably say that this will be our last record on Universal. It was great, but major labels are always struggling. They’re polishing the brass on the Titanic. We had a good run, for sure, but there was always the risk of getting the major label rigmarole. It’s always about the profit. It’s always about the top dollar and what’s happening now, which is why every label is signing a bunch of bands that sound like Mumford & Sons. We released a super heavy rock record, but whatever. They’ve been good to us and breathed some good life into our career. They got you a No. 1 single, so that’s pretty awesome. Luckily, Universal was great. They didn’t try to screw up this release in my opinion, but all is not lost. A good record is a good record. I’m a huge Acceptance fan, and I know there’s a lot of Acceptance fans on Absolute Punk. Are you still bummed that that record and band didn’t really go anywhere or reach that big of an audience? It’s interesting now when I listen back to it because it’s still a really good record. It’s still pretty strange to me that we weren’t bigger than we were. I think it was just a timing thing, honestly. I think we broke up before people were aware of what we were or what we were doing. At the time, people just didn’t know who we were. It was one of those same things, this total major label miss. We didn’t really have a single. It was the best record that no one ever heard, but whatever. If things didn’t go the way they did, I wouldn’t be talking to you right now. To me, that was an eventuality for Acceptance all the time, whether we broke up then or we broke up after another record. That band was really volatile, for sure, with the dynamic of all the guys. It’s weird because I remember seeing you on tour and it seemed all the supporting bands ended up blowing up but you ended up breaking up. You have a lot of drive and ambition if you’re in a band, and sometimes it can be crushing. Not necessarily that other people’s success will ruin your life, but when you have an ambition, you have to have a certain confidence about what you’re doing. When you see everyone else succeed and you feel like you’re not doing anything, that can be very disheartening for someone that’s really confident. You have to walk the line between confidence and cockiness. If you think you’re really good and you feel like no one else thinks you’re good, it almost makes you want to quit. That’s where our singer got to. Do you know if Jason’s still selling cars? I don’t know, I think so. I know he’s doing really well. I haven’t talked to him in forever. I talk to probably Kaylan the most, our other guitar player. I get lunch or dinner with him every time I go home to Seattle. He kind of keeps me in the loop about what’s going on and the rest of the dudes. There’s always been whispers of reunion stuff here and there. Basically, I think Jason is the last person everyone is waiting on. I don’t even know what that would look like or what we would do. I just want to get the dialogue going because it’s been awhile. I think a lot of people would like that, and I would like it, too. There was never any closure for the guys in Acceptance. We just said we were done and never played any final shows or anything. There was just never any closure. I think you could definitely do a couple one-off shows here and there or something. I think if we did reunion shows, even if they were just West Coast or whatever, I think the other band dudes would be surprised how many people would turn out. Do you still have completed songs that were never released sitting around somewhere? I’m not sure. I know we put some up online. We were demoing for a new record, so I can’t remember how many we recorded and how many we put out there. I used a lot of songs that were demoed on Anberlin records after that. What was originally an Acceptance song that became an Anberlin song? “Retrace” was a song where the music was written originally for Acceptance. “Blame Me!” was originally written for Acceptance. I’d have to listen. A lot of them were used on New Surrender, for sure. Actually on Dark Is the Way, the riff on “Closer” was something I was messing around with before we broke up. But yeah, across all the records there’s little things here and there. Vitals was a reunion for the band with Aaron Sprinkle, who did the first three records, which you weren’t there for, but he also did Phantoms, which you were there for. What was it like from your perspective working with him again and having your own reunion of sorts? What was different or the same about recording with him with Acceptance versus with Anberlin this time? When Acceptance recorded with Sprinkle, we were young songwriters. I’ll definitely give Sprinkle credit. When you listen to that record, most of the cool things that are going on production-wise were definitely Sprinkle. He really helped arrange those songs. He had really cool ideas and would put keys in there, stuff like that. We didn’t really have that capability back then. We had everything on guitars, but we have songs on that record with a Rhodes and all that kind of stuff, and that was Sprinkle, for sure. Recording with him again, however many years later. I think it was eight years or something like that. Yeah, Phantoms was what? 2005? Yeah, but he did Black Lines to Battlefields, too. That was our first time recording with him, which was probably a couple years before that. At this point, I’ve been touring for a long time and writing songs for a long time, so you just come back a better musician. Sprinkle definitely helped a lot on Vital. It was the same kind of thing, like getting really cool sounds and arrangement-wise. He heard the demos that we had going into the record. The songs pretty much sound the same as the demos. We’d go into the studio and try to get better sounds than we had on the demos, for the most part. It was good to go back to Sprinkle, it really was. It was just natural from the onset. There’s always this weird period when you record with someone new, like a feeling out period of how does this work and who does what in the band. During the first week the producer might not remember everyone’s name, whereas we just basically hit the ground running with Sprinkle. We did preproduction in Seattle and basically left Seattle with two songs pretty much finished already after preproduction, which is great. We just started recording. On this record it seemed to be a lot more of a collaborative writing process, with more people bringing their ideas to the table, and I know Joey had a ton of material at the start of things, too. How did this experience stack up with the last two records that you did? It was great, like you said. Nate had written a few of the ideas on Dark Is the Way, and for Vital I think three or four of the songs were originally Nate’s ideas. That makes four people writing songs, Steve and Joey, myself and Nate, so that makes a bigger pot to pull from at the end of the day when you’re choosing songs, trying to get ideas. It was great. Everyone had a shared vision. I think every record we kind of have a shared vision. The only one that felt discombobulated was New Surrender, in my opinion. Just being on a major, a new producer for the guys and first record not recording with Sprinkle. Every other record since then felt like we go into it with a pretty concise idea of what we want as a band, and it kind of ends up exactly how we want it. Yeah, the whole process was great. We had almost 80 demos, honestly. We had so many songs for this record. Now will you guys reuse some of that material in the future or do you like to start fresh with every record? You always have it. If you think you have something really strong, you definitely will try to rehash it and submit it for the next record. For example, on Vital “Little Tyrants” was actually a demo for Dark Is the Way. We just didn’t feel like it fit the vibe of that record, so we ended up putting it in the back pocket. But for this record it made more sense, so it ended up on the record. There’s a lot of material that has been floating around for records. You’re just kind of like, Remember that song? Oh yeah! Let’s give that one another try. It always depends on if we can write to it or not, melody-wise. Maybe inspiration didn’t strike first time around, but a couple years later, who knows? So with the whole label thing, what do you have going on for the rest of the year? Will you be touring for most of it? I heard you were also starting work on the next record. What’s the plan with that? We’re constantly writing, especially on the road. We’re always set up in the background with computers and keyboards, trying to get down little ideas here and there or whatever. So, a lot of touring. I think we’ll be doing a Canadian run. We’ll be back in the States a lot. I think we’re going to Australia at some point this year, as far as I know. We’re definitely on tour all year.